Pension is located in Prague 8 in the old main road to Usti nad Labem, Dresden. 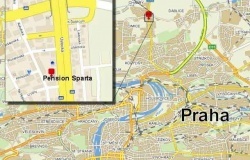 Pension Sparta is well - connected with Prague Public Transport and in front of Pension Sparta we have bus station ,,Prunéřovská” with buses 169, 162 370, 371, 373, 374 or tram station ,,Vozovna Kobylisy” which is situated 15 min by walking. Trip to historical center from Pension Sparta by public transport is 20min.